Everton left it late to break the resistance of League One's Carlisle and reach the FA Cup fourth round. James Vaughan latched on to a poor backpass to put Everton ahead before Carlisle levelled when Adam Clayton's shot was deflected in by Kevan Hurst. The visitors almost took the lead when skipper Danny Livesey's shot smashed back off the crossbar. 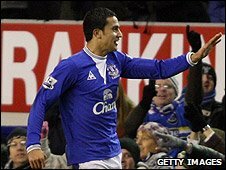 But Tim Cahill fired in a low shot and Leighton Baines converted a late penalty as Everton struggled through. The injury-time spot-kick, which was won when keeper Adam Collin brought down substitute Kieran Agard, meant Everton won by a scoreline that was flattering. And that was a view taken by the home fans, who gave brave Carlisle a standing ovation at the end. Everton, last year's beaten finalists, had been frustrated for long periods by the defiant visitors. And they might have suffered an upset had Livesey's shot from 12 yards gone in rather than rattling the bar when the score was 1-1. But it was not to be, and Everton, who had Phil Neville in their starting line-up for the first time since he suffered a serious knee injury in September, will count themselves a little fortunate to be in the hat for the fourth round. "The scoreline was a little flattering but we are through. We are also still in Europe and our league form is picking up, so things are starting to go our way. "I was not surprised by Carlisle, but I was disappointed that when we went one up early on, we were not able to build on that and control the game better. "We were disappointed with a lot of things but I cannot be disappointed with the result. "We had nine players injured and two away at the African Nations Cup, plus one suspended." "We were pleased with what we did. We matched a top Premier League side from start to finish. "They have been around the top of their division for a while, and we were never outclassed. "Maybe with a little more rub of the green we could have won, we were certainly talking in those terms at the break. "It was also nice to hear the Everton fans applauding us off at the end. They knew we had done well." 90:00+4:29 The referee blows his whistle to end the game. 90:00+4:02 Assist by Keiran Agard. 90:00+4:02 GOAL - Leighton Baines:Everton 3 - 1 Carlisle Penalty taken left-footed by Leighton Baines and scored. Everton 3-1 Carlisle. 90:00+2:58 Booking Adam Collin booked for unsporting behaviour. 90:00+2:56 Adam Collin concedes a Penalty for a foul on Keiran Agard. 88:19 Shot from just outside the box by Steven Pienaar misses to the right of the goal. 87:32 Free kick awarded for an unfair challenge on Ian Harte by Keiran Agard. Ian Harte takes the free kick. 85:17 Substitution (Everton) makes a substitution, with Keiran Agard coming on for James Vaughan. 85:17 Ian Harte challenges Tim Cahill unfairly and gives away a free kick. Phil Neville takes the free kick. 84:12 Substitution (Carlisle) makes a substitution, with Joe Anyinsah coming on for Graham Kavanagh. 81:28 GOAL - Tim Cahill:Everton 2 - 1 Carlisle Tim Cahill finds the net with a goal from close in to the bottom left corner of the goal. Everton 2-1 Carlisle. 79:45 Substitution Seamus Coleman replaces Tony Hibbert. 79:00 Steven Pienaar fouled by Adam Clayton, the ref awards a free kick. Lucas Neill takes the free kick. 75:53 Save by Adam Collin. 75:53 Substitution (Carlisle) makes a substitution, with Scott Dobie coming on for Vincent Pericard. 75:32 Steven Pienaar takes a shot. Blocked by Adam Clayton. 72:27 Corner taken short by Leighton Baines. 70:16 Danny Livesey takes a shot. 69:09 Inswinging corner taken from the left by-line by Graham Kavanagh, clearance by Tim Cahill. 66:04 Free kick awarded for an unfair challenge on Tony Hibbert by Matthew Robson. Lucas Neill takes the free kick. 65:32 Marouane Fellaini fouled by Adam Clayton, the ref awards a free kick. Phil Neville takes the free kick. 64:35 Booking Phil Neville is cautioned by the ref for unsporting behaviour. 64:01 Tom Taiwo gives away a free kick for an unfair challenge on Tim Cahill. Free kick taken by Phil Neville. 62:59 Free kick awarded for an unfair challenge on Diniyar Bilyaletdinov by Graham Kavanagh. Johnny Heitinga takes the free kick. 61:48 Phil Neville concedes a free kick for a foul on Kevan Hurst. Ian Harte takes the free kick. 59:43 Corner taken by Leighton Baines played to the near post, Evan Horwood makes a clearance. 59:28 Marouane Fellaini takes a shot. Adam Collin makes a save. 58:50 Leighton Baines takes a outswinging corner from the left by-line to the near post, Vincent Pericard manages to make a clearance. 57:29 Corner taken by Leighton Baines from the right by-line played to the near post, clearance made by Graham Kavanagh. 57:14 Marouane Fellaini takes a shot. Blocked by Ian Harte. 55:14 Marouane Fellaini fouled by Vincent Pericard, the ref awards a free kick. Direct free kick taken by Tim Howard. 51:25 Kevan Hurst takes a shot. Save made by Tim Howard. 49:22 Free kick awarded for an unfair challenge on Steven Pienaar by Richard Keogh. Johnny Heitinga restarts play with the free kick. 48:27 Free kick awarded for a foul by Diniyar Bilyaletdinov on Tom Taiwo. Adam Collin takes the direct free kick. 47:14 Adam Clayton takes a shot. Save by Tim Howard. 46:13 Graham Kavanagh takes a shot. Tim Howard makes a save. 45:49 Phil Neville challenges Graham Kavanagh unfairly and gives away a free kick. Direct free kick taken by Ian Harte. 45:00+2:21 The first half comes to an end. 45:00+1:29 Tim Cahill gives away a free kick for an unfair challenge on Adam Clayton. Ian Harte restarts play with the free kick. 44:39 The referee gives a free kick against Vincent Pericard for handball. Free kick taken by Johnny Heitinga. 44:02 Unfair challenge on James Vaughan by Ian Harte results in a free kick. Direct free kick taken by Phil Neville. 43:18 Graham Kavanagh fouled by Marouane Fellaini, the ref awards a free kick. Free kick taken by Ian Harte. 38:12 Free kick awarded for an unfair challenge on Lucas Neill by Richard Keogh. Free kick taken by Johnny Heitinga. 35:26 James Vaughan produces a right-footed shot from outside the penalty box and misses wide left of the target. 35:00 The offside flag is raised against James Vaughan. Ian Harte restarts play with the free kick. 33:31 The official flags Tim Cahill offside. Direct free kick taken by Adam Collin. 32:19 Marouane Fellaini takes a shot. Save by Adam Collin. 32:00 Steven Pienaar takes a shot. Save made by Adam Collin. 31:14 Matthew Robson takes a shot. Save by Tim Howard. 30:17 Diniyar Bilyaletdinov concedes a free kick for a foul on Adam Clayton. Evan Horwood restarts play with the free kick. 28:32 Ian Harte takes a shot. Tim Howard makes a save. 27:47 Outswinging corner taken by Graham Kavanagh from the right by-line played to the near post, Marouane Fellaini manages to make a clearance. 25:55 Close range header by James Vaughan goes wide of the left-hand post. 24:57 Foul by Ian Harte on Marouane Fellaini, free kick awarded. Tim Howard takes the direct free kick. 24:33 Short corner worked by Graham Kavanagh. 23:51 James Vaughan is caught offside. Adam Collin takes the direct free kick. 23:31 Tim Cahill takes a shot. Save made by Adam Collin. 21:50 Effort from a long way out by Graham Kavanagh goes wide left of the target. 20:19 Free kick awarded for an unfair challenge on Johnny Heitinga by Vincent Pericard. Direct free kick taken by Tim Howard. 17:12 Assist by Adam Clayton. 17:12 GOAL - Kevan Hurst:Everton 1 - 1 Carlisle Kevan Hurst finds the back of the net with a goal from close range to the bottom right corner of the goal. Everton 1-1 Carlisle. 16:27 Free kick taken by Ian Harte. 16:27 Booking Marouane Fellaini goes into the referee's book for unsporting behaviour. 16:17 Marouane Fellaini challenges Tom Taiwo unfairly and gives away a free kick. 15:42 Shot from just outside the box by Johnny Heitinga misses to the right of the target. 15:03 Free kick awarded for a foul by Danny Livesey on Leighton Baines. Free kick taken by Leighton Baines. 14:05 Header from close in by Kevan Hurst misses to the right of the target. 13:07 Free kick awarded for a foul by Tom Taiwo on Diniyar Bilyaletdinov. Phil Neville takes the direct free kick. 11:39 GOAL - James Vaughan:Everton 1 - 0 Carlisle James Vaughan scores a goal from inside the area low into the middle of the goal. Everton 1-0 Carlisle. 4:03 James Vaughan challenges Danny Livesey unfairly and gives away a free kick. Ian Harte restarts play with the free kick. 2:42 Tim Cahill challenges Adam Collin unfairly and gives away a free kick. Direct free kick taken by Adam Collin. 1:56 Adam Clayton has an effort at goal from just outside the area which goes wide of the left-hand post. 1:31 Graham Kavanagh takes a inswinging corner from the left by-line played to the near post, Tim Cahill makes a clearance. 0:17 The assistant referee flags for offside against Graham Kavanagh. Direct free kick taken by Tim Howard.